Hanging Slate Address Sign with a Golf Ball - - on a tee patiently waiting for you to hit a hole-in-one. Personalized 12" x 16" natural slate address plaque. Custom made for you. The design, color, and personalization text will be the same on both sides. Designed to hang from your own bracket or the optional Stone Mill wrought iron bracket (sold separately). Made from newly quarried slate hand cut to size and shape. Comfort House also sells other design options: cats, dogs, ducks, palm trees, bunch of grapes large animals (horse, deer, bear, moose), nature (leaves, shamrocks, trees), and beach (sail boat, dolphins, seashell). See Comfort House item #66615F). Four color choices: white letters on black slate; gold letters on black slate; black letters on green slate; white letters on green slate. Line 1 is optional and holds three 1" characters. Line 4 holds fifteen 1.25" characters. Note: The features and color variations inherent natural rock enhance the beauty and unique character of these slate signs. 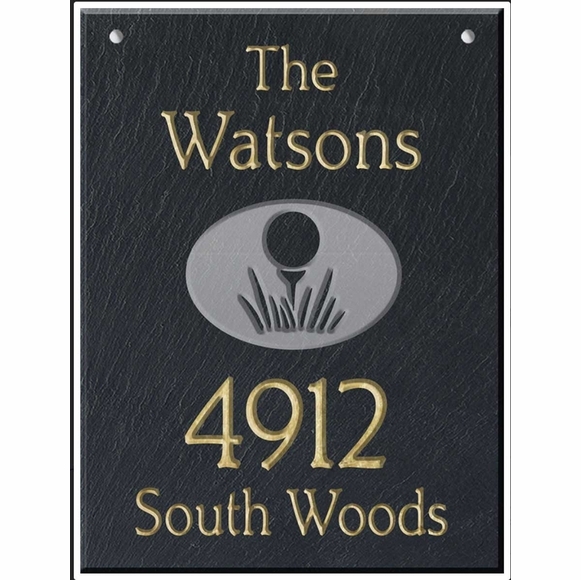 You can also buy this golfing theme hanging slate address sign in a horizontal orientation.